Home » Senior-Friendly Tech » The Best Universal Remote for Seniors: Simple, Easy to Use, and Large Buttons! The simple act of watching a favorite TV show is often a challenging task for many seniors. Remotes with too many buttons and small writing only cause frustration. Finding the best universal remote for seniors and the elderly can make their lives – and TV watching – so much simpler! It is no wonder that today’s remote controls confuse seniors and younger folks alike. My new TV that I just purchased has a remote control with over 60 buttons! I am in my late forties and have trouble reading some of the buttons without glasses. So, it is important to find a universal remote that seniors and the elderly can use without getting frustrated. As I learned when shopping for my own grandmother, there are lots of options out there. So, I created this guide to help you find a simple TV remote control for you or a senior citizen you love! Get the summary of the information and recommended universal remote controls for seniors in the following video. Or, keep scrolling to read the post in its entirety. In a hurry and just want to see what the best universal remotes are for seniors? Here are my quick picks for simple TV remotes that are easy to use with big buttons that are easy to read. Or, keep scrolling to learn how to choose a remote for seniors or jump to my review section for more details and description of each model. Very easy to use remote with only 6 big sized buttons. Can't be used with cable box or satellite. 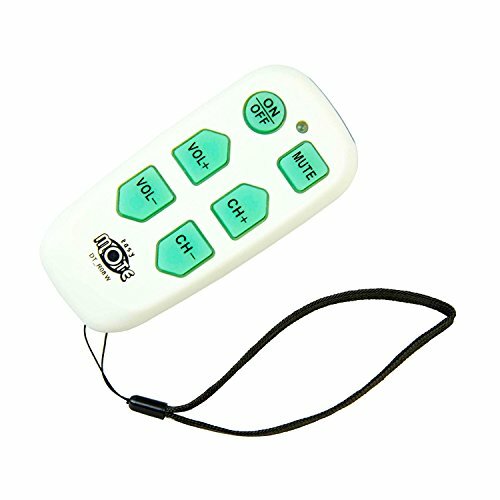 Basic 8 button remote control with buttons that light up. Will not work with cable or satellite boxes. Simple 6 button remote control that can control 2 devices including cable or satellite boxes. More advanced remote control that controls 2 devices but has more buttons & only works with certain brands. One day the TV remote is working just fine. Then it suddenly seems like it is hard to understand and control. Wrong buttons are pushed. Programming is lost. And, the senior is left without control of their TV until someone comes to fix it. This seemingly sudden loss of control is especially common for those suffering from failing eyesight, weakening strength or early dementia. Using a remote seems like a small matter for most of us. But, not being able to use a remote to control a TV is very frustrating for seniors. It even undermines their ability to function independently. For seniors with dementia, I have even heard of confusing a remote control with a cordless phone! This often leads to calls to family members when they can’t get the TV show on that they want. Or, maybe they just give up and don’t even try. Most remotes have hundreds of small, hard-to-press buttons and are confusing for seniors to use. Finding a simple TV remote control for elderly people will put them back in control. For many elders and seniors, the television is their link to the outside world. The evening news is their primary source of news and information. Often, the TV us their primary source of entertainment. So, you can see why not being able to control the TV is such a big deal for them. But, there are very simple, easy to use remote controls for TV’s out there. First, we will look at the important features of an easy to control remote. Then, I have a few recommended products as examples. Is the senior getting confused or just having trouble seeing the buttons? Do they need to control just the TV or a cable or satellite box too? Do they watch TV in the dark or in bed? Knowing the answer to these questions will make your shopping a little easier. There is so much to consider when shopping for an easy to use remote control for elderly and seniors. The Fewer Buttons, the Better! Most seniors only use the basic functions of their remote controls. They want to control the volume and the channel and be able to turn the TV on and off. Rarely are other buttons used. Another benefit of having only 5 or 6 big buttons on the remote is that the print is also larger than standard remotes. So, elders with failing eyesight or vision problems can clearly see the buttons and their functions. Large Buttons With Large Print are Generally Better. Large, raised, tactile buttons are simpler for many elderly people to use. Being able to see the button and feel it under their fingers will improve their use of the remote. This style of universal remote is very important for seniors with arthritis or other weakness in the hands. Often, having to find and push tiny buttons is painful or impossible. For elderly people with vision problems, big button universal remotes with large print are generally best. Bold, thick, block style print is much easier to read than thin or cursive print. Easy to use remotes for the elderly must be designed in a way that makes them easy to hold and reduces stress on the fingers and palm as much as possible. People who suffer from carpal tunnel syndrome or other ailments that reduce the strength of their grip must also be able to hold onto the remote easily. Remote controls that are rounded and thicker fit frail and weak hands better than thin styled controls. This style curls into the palm of the hand and doesn’t require a strong, pinching grip to be able to hold onto it. Of course, to be truly helpful, remotes for seniors should also be compatible with a large number of TV’s and easy to program. If the senior has cable or satellite service, make sure the remote can control those devices as well. But, the remote shouldn’t be too easy to reprogram! Especially for elderly people with dementia or Alzheimer’s. Look for the location of “Set” or “Program” buttons. You don’t want these where the senior can accidentally activate them and wipe out the current programming. Or, expect a phone call that the remote isn’t working! Also, they should keep their programming through battery changes. That way you won’t have to reprogram it every time a battery is removed. This is also helpful if the remote is dropped and the batteries fall out. Just put the batteries back in and it will be as good as new. So, using the criteria above, I have come up with the following list of simple universal TV remotes that are easy for most seniors to use. The Tek Pal is probably the most basic and easiest to use TV remote that you can get. It only has 6 large buttons that power the TV on and off, browse the channels, adjust the volume and put the TV on mute. Not for use with satellite boxes and DVD players. 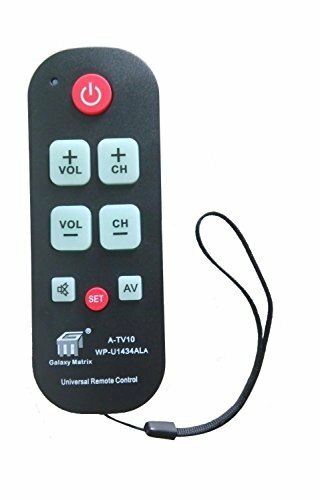 The Amazshop 247 A-TV10 Large Button Universal Waterproof Remote Control is a popular choice for many seniors. It’s a truly simple remote with easy-to-see and easy-to-press oversized buttons. In addition to the power On / Off button and the programming button, it has only 6 other buttons (change channel, change volume, mute, and AV mode). Overall, it’s an ideal replacement for standard remotes. Works with standard television or television with an inserted direct line cable. 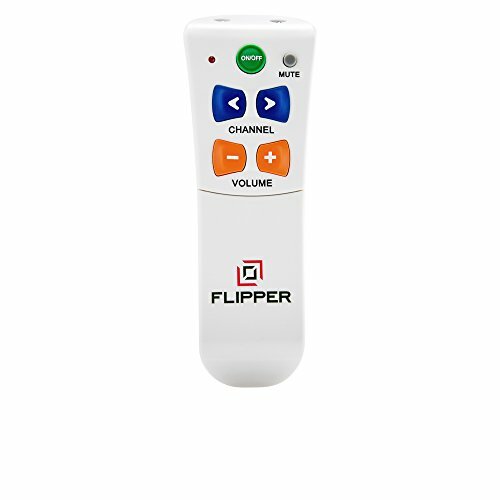 The Flipper Remote is an easy to use universal remote control with large buttons designed for seniors or people with poor vision. It makes using a remote control easy. And, it works with almost any television, cable or satellite box. Set up only takes about 10 – 15 minutes. It also has a convenient lock feature which prevents accidental re-programming of the remote! No more calls that the remote won’t work! Compatible with multiple devices, including TV and Cable, Satellite or DTV box. Color-coded buttons for easy identification: Green for power, Blue for Channel selection, Orange for Volume adjustment and Grey for mute. 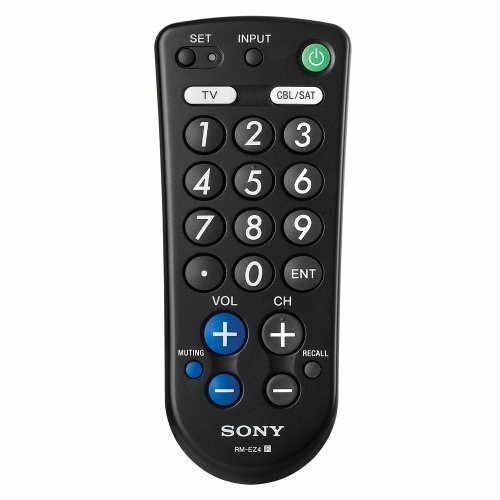 Sony’s RM-EZ4 is a large, slightly over-sized remote that can operate a television as well as a cable or satellite box. While it has more buttons than the other remotes listed in this article, the buttons are quite large, easy to read and well spaced out. 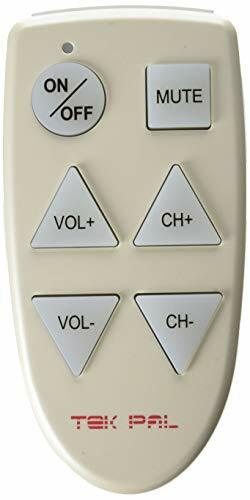 Still, I wouldn’t recommend this remote for seniors with dementia. But it would work well for seniors who need easier to read buttons but want more functions than a basic remote. It has two separate buttons for selecting the device to be controlled: either TV or the cable/satellite box. Commonly used buttons like Volume and Power On buttons are color coded for easy identification. One limitation of this remote is that it is a pre-programmed remote and if your TV or device is not programmed in the device, it won’t work. So, you will need to check whether your TV is compatible with this remote before selecting this one. But this may be an off chance, as it is programmed with tons of device codes already. This is a great large button remote control for the elderly. It has all the features you’d want out of a universal remote, including big, bright buttons, large text on these buttons, an added wrist strap, and personal customization features. I purchased this remote for my grandmother when she began to have trouble controlling her TV. It was a breeze to program and worked very well for her. The channel buttons controlled her cable box and the volume buttons turned the TV up and down. Which is just what she needed! Gives seniors and elderly complete control over their entertainment systems because it controls both the TV and Cable Box with the same remote. Comes with a strong wrist strap made from a sturdy, yet soft, material that won’t irritate skin but will give you added security and peace of mind when using this remote. This feature also makes it harder to lose. It also has a universal library with a ‘Quick Search’ function that will scan for your TVs code which is easy and takes a matter of minutes. Finding a simple TV remote control for elderly people will help them re-establish their independence. It will also allow them to stay up to date with news and entertainment, keeping them engaged with current affairs. When shopping for basic, easy to use remotes, look for big buttons that are well labeled. You want to find a universal remote with large print on the buttons too. The fewer buttons the better! Look for other useful features like a wrist strap or personalized preset settings as well to make this experience as enjoyable and easy as possible for your senior. Is the TV volume also becoming a problem? Click here to learn more about Improving TV Sound for seniors. For other simple technology products for seniors and the elderly, check out my article on easy to use microwaves, simple laptops, and basic radios that seniors will use and enjoy. Please share your experiences with TV remotes in the comments below. Do you know of other remotes that are easy to use? Which of these TV remotes did you choose? Did you find this guide helpful? If so, please share on your social networks with friends and family! I disagree that most elderly want 4 functions, I believe they want only 3. I am searching for a unit without “mute”. My 91 year old mother in law understands on/off, channel, and volume, but if she accidentally hits “mute” she tells us the TV or remote isn’t working. I’m still searching for something like the Seki Slim learning remote (no tedious setup like the Tek Pal) but one with only three functions. Looks like I’ll have to buy what exists and disable the fourth function myself. Maybe make a youtube video of how to disable and if it gets enough hits, we’ll finally get a 3-function remote. If TV stations held to a standard volume, and commercials weren’t rude, we could do away with remote volume and just set it at the TV. Hi Ray – thanks for stopping by and leaving these valuable comments. I have been researching and I cannot find a 3 function remote either. Seems like everything has mute. But I’m going to keep looking. Thanks also for the video suggestions. My goal for next year is to start making videos for some of my posts. I’ll put this one to the top of the list. Loud commercials are a pet peeve of mine too – another advantage of cutting the cord and moving to streaming programming! Has anyone out there seen a 3 function TV remote anywhere that you can let me and Ray know about? I am looking for a large button tv remote for my mom to use. The problem is she is in a nursing home and her cable is delivered to her room through a simple cable that I assume is connected to a cable box located somewhere in the nursing home. I am sure it serves all the residents. I have not found a remote that can be programmed under these circumstances. Any suggestions?